I didn't get a chance to post these pictures before my surgery. 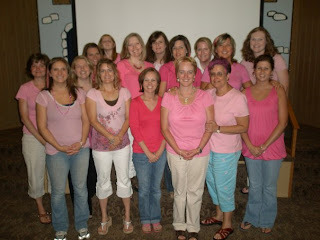 Above are some of the ladies at Maple Hill Church of Christ who wore pink for my support. 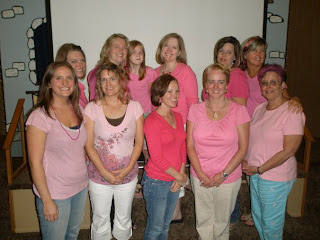 These are the ladies who bought pink hair extensions to wear in their hair. A special Thanks to Danielle Pruitt who put a list together of prayers for me throughout the day of the surgery. She had people sign up for every 15 minutes from 7:00 in the morning to 7:00 in the evening. Each person stopped what they were doing and prayed for me. How amazing are these friends of mine. I will never be able to do half of what they have done for me. Everyone has been so kind and I thank my God for every thing that they have done for me. A Party, New Hair, and the Beach!